We are often asked about bathroom lighting. The fact of the matter is that it’s not as straightforward as “I like that light, I’ll buy it for my bathroom.” Something called an IP rating is rather important in a bath/shower or wet-room. But, just because you have fallen for a light that is not IP rated it does not mean you can’t use it in your bathroom. IP simply stands for ‘Ingress Protection’ and the numerical rating relates to how sealed a product is agains intrusion this could be dust or water and, as everyone knows, water and electricity do not mix so we don’t want water to get inside our bathroom lights. The IP number is composed of two numbers, the first number refers to protection against solid objects, which we don't really need to worry about in a bathroom but as a rule of thumb the higher the number the smaler the particle it is protected against- and the second against liquids which is our area of concern in a bathroom again the higher the number the better the protection. You will need a higher IP rating over a steamy bath or inside a shower than you do near the door as the risk of water entering is greater. With this in mind the bathroom is divided into different 'zones' each with a recommended IP rating for it. The diagram below is a useful and clear illustration of this. Zone 0: Inside the bath or shower. Here lights must be low voltage and be IPX7. Zone 1: The area around the bath or shower up to a height of 2250mm from the floor and at a radius of 1200mm from the water outlet. A minimum rating of IPX4 is required. 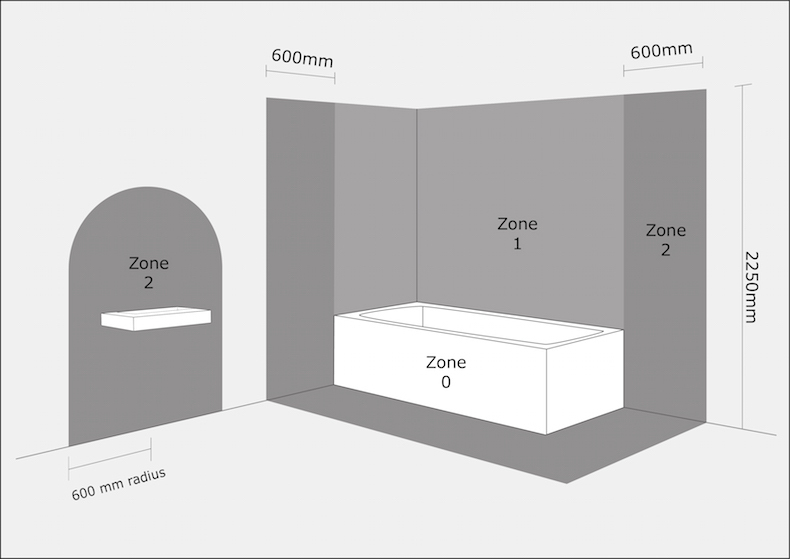 Zone 2: An area stretching 600mm outside the perimeter of the bath and to a height of 2250mm from the floor. In this zone an IP rating of at least IPX4 is required. In addition it is good practice to consider the area around a washbasin, within a 600mm radius of any tap to be considered as zone 2. Outside Zones: Classed as anywhere outside Zones 0, 1 and 2 (subject to specific limits) and where no water jet is likely to be used. No IP rating is required here unless water jets are used for cleaning purposes in Zones 1, 2 and “Outside Zones”, in which case a minimum IPX5 must be used. 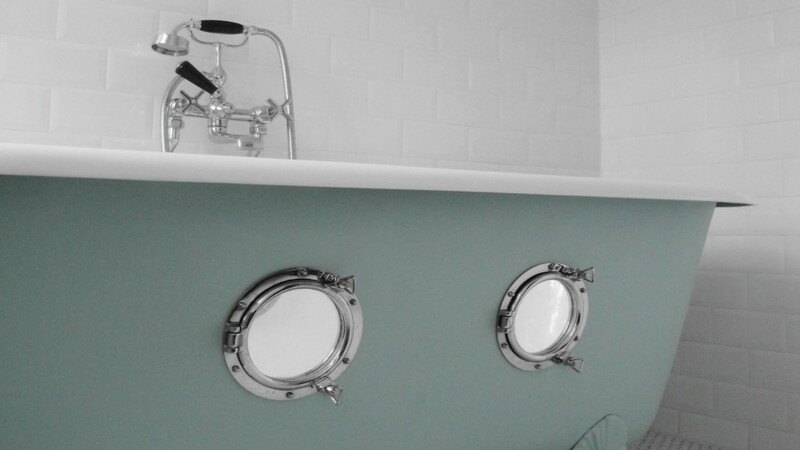 skinflint lights are not IP rated as they are all original and have been completely restored; even lights such as our divers worklights which would have been used underwater at considerable depths or extreme environment lights such as these vintage bulkheads by Heyes are no longer suitable for the 'Zones' for which were originally built although they will be fine for your outside zones. If you are looking for a vintage style bathroom light for Zones 0, 1 or 2 you will need to consider a reproduction light from a company and save the genuine vintage lighting for outside these inner zones.